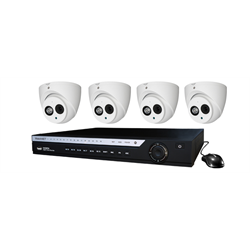 The EVI-04KIT4-40IRBT from WatchNET is a versatile HD camera and DVR recording kit supporting HD over coax cameras, analog CCTV cameras and IP cameras. This kit includes 4 x 4 megapixel HD over coax night vision security cameras for amazing high definition video recording. Video is captured in full colour during the day, and the cameras automatically switch to night vision mode when it gets dark for viewing in pitch black up to 50 meters. 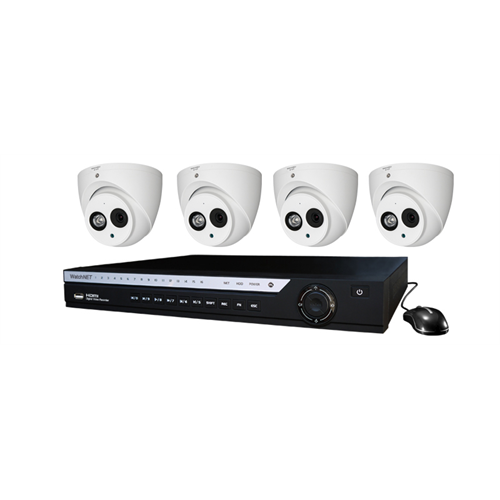 The included EVI-0440 DVR can support up to 4 analog or HD over coax cameras at any given time plus an additional 2 IP cameras. As a Penta-Brid DVR it can support HDCVI/XVI, TVI, AHD, CCTV analog or IP cameras. H.264 video compression gives this DVR extended storage time on the 2TB hard drive provided. The DVR comes with 2 SATA slots that can each hold a hard drive up to 6TB each. Not included: coax or ethernet camera cables.